What skills does your child need to develop in order to learn easily? 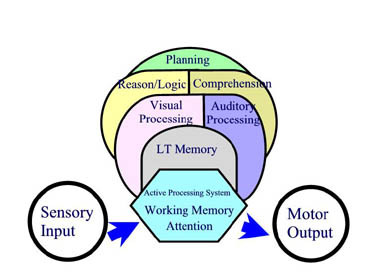 In the model below, the lower section is called the active processing system which represents what the mind is occupied with at any given time. The upper section represents additional mental skills that are available to be used and interact with any incoming information. The active processing system includes attention and working memory (the ability to retain information until it is further analyzed). It is the work center. As incoming information is processed, other mental skills come into play and interact with it. For example, long-term memory is used to compare incoming information with past experiences so that we can determine if it is new, old, or a modification of information we have stored in the past. The degree to which all these individual mental skills are developed and the efficiency with which they work and integrate with each other, factor heavily into the overall ability of the processing system to handle information accurately, quickly, and efficiently. PLEASE NOTE: Studies point out that only 10 to 15 percent of learning difficulties are due to input or output problems and approximately 85-90 percent are due to poor processing skills. Let’s examine this system more closely. Attention the ability to stay on a task for long periods of time or ignore distractions will limit learning. Processing speed information may be lost before it can be used, requiring the student to start all over again. Visual processing tasks that require seeing in your head (math word problems and comprehension) will suffer. Long-term memory wrong conclusions and answers will result. Auditory processing sounding out words when reading or spelling will be very difficult. Reasoning and logic problem solving, math, and comprehension will be poor. Comprehension making sense of new information will suffer. Let's look at how we do that by looking first at testing and then at training. Copyright © 2001, 2002, 2003 [Learning Disabilities Learning Info.com]. All rights reserved.